If you can maintain a ‘whole body’ approach, and avoid getting bogged down in complexities, but just get on and do it, Pilates really works! An osteopath that used to work closely with a studio that I teach in would frequently refer his patients to the studio. Rather than giving them instructions for specific things to work on, he would advise them to “just do Pilates”. Presumably he knew that nothing extra was required. I know, as a teacher, it’s easy to get caught up in the minutiae, or to become engrossed in trying to ‘fix’ a particular issue in a client. Of course, Pilates is a holistic practice. And the ‘edge’ that we may have over some medically trained practitioners is exactly that. We could probably debate for ever how much Joseph really understood, on an anatomical or bio-mechanical level, about what he was doing. 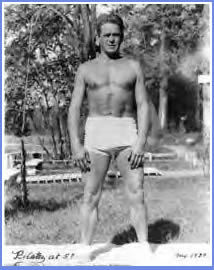 As I’ve asserted previously on this blog, whatever progress we think we’ve made since the 1940s, Pilates understood movement. This allowed him to devise a whole array of effective exercises, along with some foundation principles, that helped people to pattern good movement in their bodies. I think I tend to take this for granted, since my ‘Pilates miracle’ happened a good few years ago now. This miracle was going to a studio, at first once, and then twice a week, and working through a routine – not strictly the same exercises every time, but a consistent warm-up, and then trying to address my whole body whilst applying the fundamental principles (even before I knew that this was what I was doing). Since then I’ve had plenty of opportunities to witness clients experiencing revelations about their own bodies, discovering that they can manage pain much more easily, increasing their range of movement and all the other things that we might expect from Pilates. More recently I’ve had a stronger reminder of Pilates’ elegant simplicity, in the transformation of one of my wife’s students. Perhaps one of the reasons that I noticed something particular in her case is that, while she has a history of various injuries, they were never the ‘object’ of her classes. When she started taking studio classes there was definitely room for improvement in how she stood, and the front of her body showed more muscle development than the back (We have shared a few laughs since at my early attempt to express, delicately, “your buttock should be more distinct from your thigh”). Six months or so on, her transformation has been remarkable – the change in her posture is easy to see. Has she been following a particular program to address this; or having ‘new’ exercises invented for her? Not at all. What she has done is attend classes two or three times a week, been diligent about working on doing some mobility work on the joints that needed it, learning the exercises/movements that are especially appropriate or valuable for her, and getting on with doing Pilates. Part 3 of What’s great about Pilates? series ..